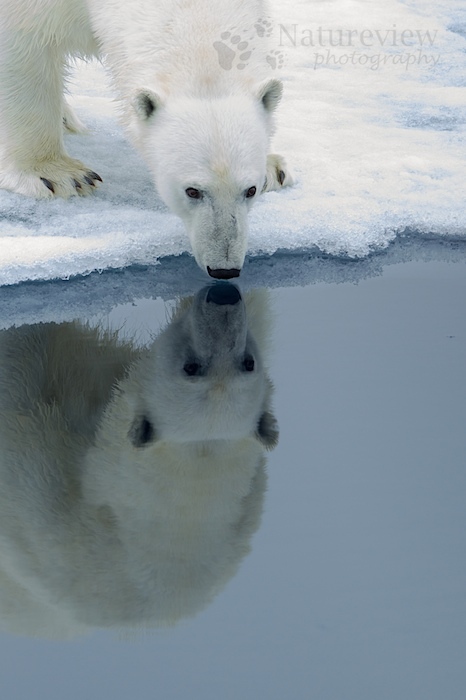 This bear appears to be looking at her own mirror image or even drinking water. That last part won’t be true, as it is salt water, which they seem to dislike to drink just as we do. This year I did see one of them drink water, but that came from a meltwater pool on the ice, which, most likely, consists largely of freshwater (or maybe a little brackish). We saw this too on our trip, but I did recall it drank, but not too sure, I will have a look in my files. Wow! Great portrait of a cool and impressive animal! So cute. I hope it is ok to re-blog this. People have to see your photos! Of course it is! Thanks. Spectacular photographs from the far North!